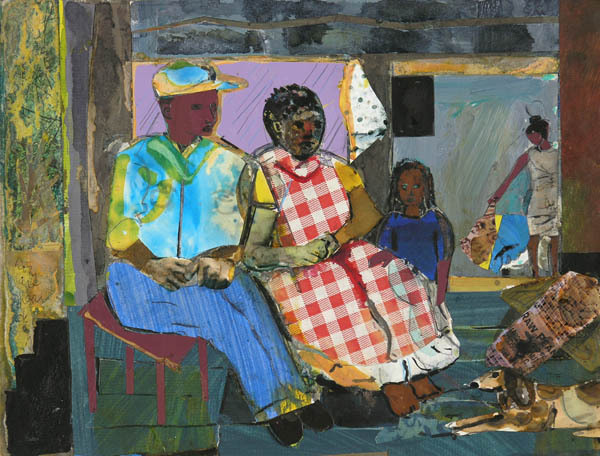 In celebration of the 100th anniversary of Romare Bearden’s birth, Jerald Melberg Gallery presented a major exhibition of over forty collages, watercolors and prints featuring the artist’s memories of Charlotte and Mecklenburg County. 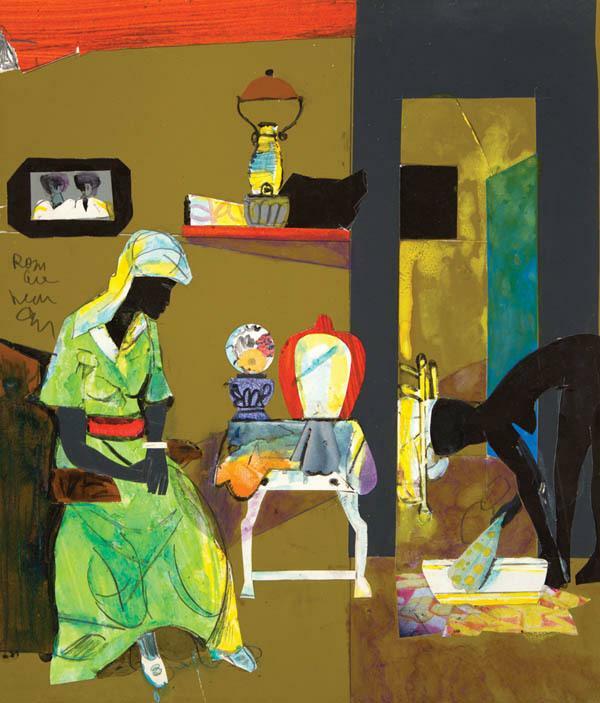 Romare Bearden was born in his great-grandfather's house in Charlotte, North Carolina, on the morning of September 2, 1911. Although at the time this was the rural south, his family was prosperous and well respected. At the age of two, Bearden moved with his parents to New York City where they felt there was more opportunity to pursue their interests in journalism and politics. Bearden's memories of Mecklenburg County, North Carolina were ingrained during summer-long visits until he was 14. These memories were the subject of his art as he wanted to transform his experiences rather than merely describe them. I am trying to explore the particulars of the life that I know best; those things common to all cultures, he once said. Drawing upon the recollections of his Southern roots for inspiration, he conjured up both his own childhood memories and the shared memories of his ancestors. Bearden absorbed the traditional rituals of the church, the hymns and gospels, sermons and testimonies; as well as the traditional rituals of the family, the music of the kitchen, the wash place and fire circle, which permeated his upbringing. 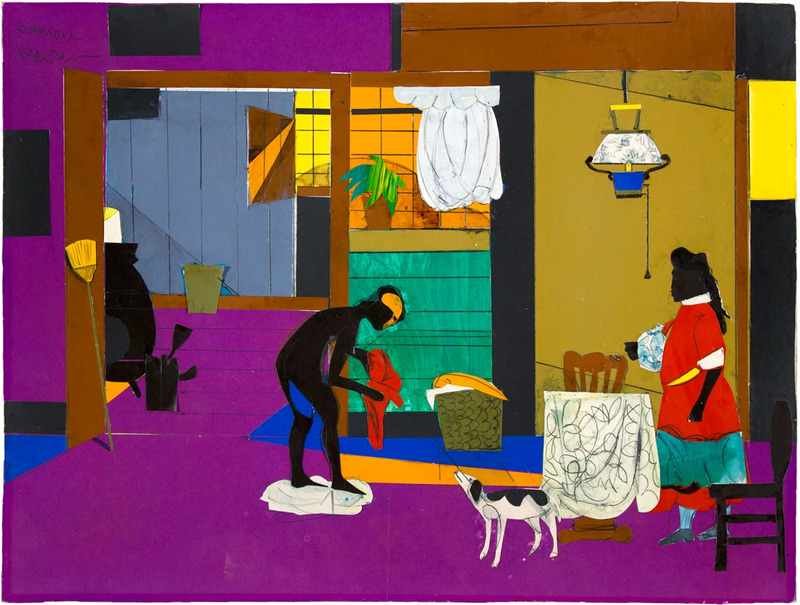 Romare Bearden's "Evening of the Gray Cat." At his death on March 12, 1988, he was called the foremost "black artist" of the 20th century, so he was. But the phrase black artist must be understood as a description, not a label. He has also been called America's greatest collage artist. In this medium, he stretched its possibilities raising it "to a mode of expression, so intensely personal, that it is difficult to think of another artist so closely associated with it." His collages reflect optimism. Even in works that represent poverty, there is still a sense of affirmation and strength. In the lives of his people-their happiness and pain, their music and ritual-he felt the potential for myth. Bearden's first retrospective was at the Museum of Modern Art in 1970. Subsequent retrospectives have been organized by the Mint Museum, the Detroit Institute, the Studio Museum in Harlem and the National Gallery of Art. 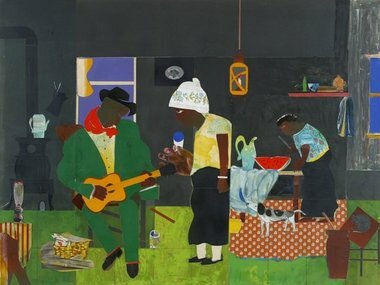 Another retrospective titled, Southern Recollections opened in September 2011 at the Mint Museum of Art in his hometown of Charlotte, North Carolina and is currently showing at the Newark Museum.